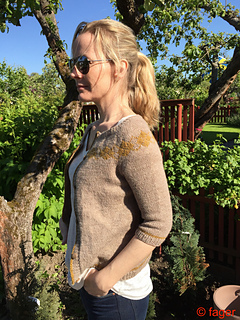 Yvette is a seamless, scoop neck cardigan mostly worked flat, from the top down. 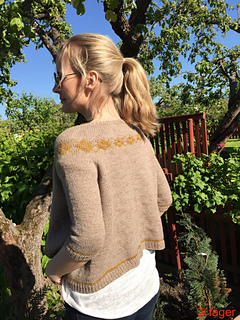 The cardigan features a diamond colourwork motif around the yoke, short rows to shape the back neck, waist shaping and narrow elbow sleeves. The cardigan is intended to be worn with a little positive ease at the chest for a comfortable fit. The pattern is divided into two separate files for easier reading: smaller sizes (XXS to M) and larger sizes (L to 3XL). Sample shown in size XS worn on a 32 inches/81 cm bust. 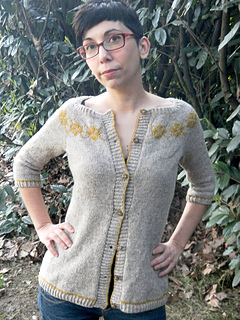 CC 1 (1, 1, 1, 1, 2, 2, 2) skein(s), shown in Genet. approx.MC: 780 (900, 1030, 1160, 1350, 1575, 1800, 2025) yards/715 (825, 940, 1060, 1235, 1440, 1645, 1850) meters; CC: 95 (110, 125, 140, 165, 220, 230, 250) yards/86 (100, 115, 130, 150, 201, 210, 230) meters. ♡ 36”/ 90cm or longer US5/3.75mm circular needle or different size to obtain gauge. ♡ 36”/ 90cm or longer US6/4mm circular needle. ♡ 36”/ 90cm or longer US7/4.5mm circular needle or different size to obtain gauge. ♡ US5/3.75mm DPNs (optional, for sleeves edging). ♡ 7 (7, 8, 8, 8, 9, 9, 10) half inch/13mm buttons. 21 sts & 30 rows = 4 inches/10 cm in stst on larger needle. 24 sts & 40 rows = 4 inches/10 cm in twisted rib (unstretched) on smaller needle.